Updated December 11, 2018 -- After nearly four years, this mod finally needed updating thanks to the Python update in the Get Famous game patch. Took me a while, but I finally got to doing so. NOTE - The Installation Directions Have Changed: The mod is now packaged as a standard ts4script file. If you don't know how to install one, the installation directions can be found in more detail below. This mod adds three commands to The Sims 4 cheat console to view, set and dump all sims gender preferences. The output of the dump is tab delimited and can easily be imported into any spreadsheet package for sorting and viewing. Open the command console using the Ctrl-Shift-C keys and type one of the available commands. genderpref.view - will show the current sim's gender preferences on the command console. Can be optionally followed by a first and last name to display the preferences of any sim. For instance, the command "genderpref.view bella goth" would display Bella Goth's gender preferences. genderpref.set M# F# - sets the current sim's gender preferences for male and female sims. The numbers should be from 0 (no preference) to 100 (maximum). This command can also be optionally followed by a first and last name to set the preferences of any sim. For example, to give Bella Goth a strong preference for male sims and a weaker preference for females, you could use "genderpref.set 100 60 bella goth". genderpref.dump - dumps a tab delimited text file into the mods folder containing all sims names, genders, ages and gender preferences. By default, the file will be named "Gender_Preference_Dump.txt", however the command can be followed by an optional filename, for example "genderpref.dump genpref1.txt" would dump the data to the file named genpref1.txt in the mods folder. See the screenshots for examples of the three command's output and a dump that has been imported into Excel. This script is packaged as a ts4script file. Extract the MTS_Scumbumbo_GenderPreferenceCommands script file from the downloaded zip file and place that into your Mods folder. You must have script mods enabled in your game options for the mod to function. This mod was written and tested on The Sims 4 version 1.47.51 (Nov. 20, 2018). Previous versions are not supported. The script source is included in the ts4script file. Since this contains only new commands added to the game, it should not conflict with any other mods. 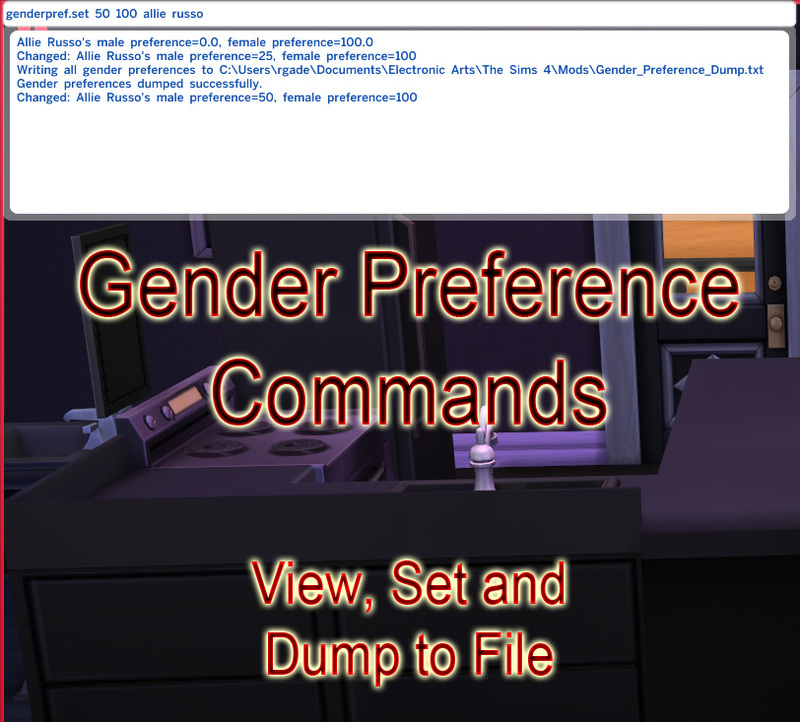 GenderPreferenceCommands.zip | Description: Console commands to view, set and dump all sims gender preferences.